A cor­re­spon­dent to the Finan­cial Times has slipped a red her­ring into the store of Win­ston Churchill quo­ta­tions. In a let­ter to the FT on April 14th, Mary Ellen Syn­on was defend­ing Irish Taoiseach Eamon de Valera’s 1945 let­ter to the Ger­man Embassy in Dublin express­ing con­do­lences on the sui­cide death of Adolf Hitler. Ms. Syn­on sug­gest­ed that this was just a for­mal­i­ty; after all, Churchill sent con­do­lences to Moscow on the death of Stal­in. A friend who is deliv­er­ing a Churchill speech in D.C. asked for some exam­ples of Churchil­ian humor involv­ing Wash­ing­ton and U.S. Pres­i­dents. “If my father had been Amer­i­can, and my moth­er British, instead of the oth­er way round, I might have got here on my own!” That brought down the house. ¡Ex ligamayorista Marrero cumple 102 años! 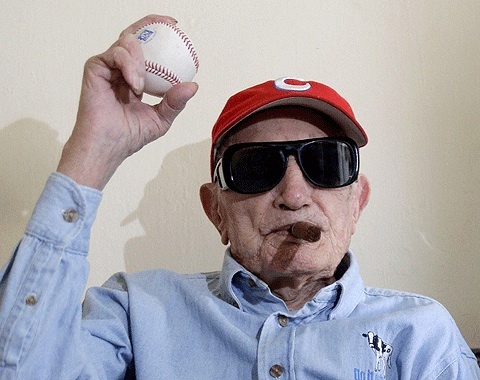 Con­ra­do Euge­nio Mar­rero, the old­est liv­ing major league base­ball play­er, cel­e­brat­ed his 102nd birth­day in Havana on April 25, 2013 with one of his patent­ed cig­ars. Con­nie passed away just short of his 103rd birth­day on April 23, 2014.